I have TONS of white in my house. 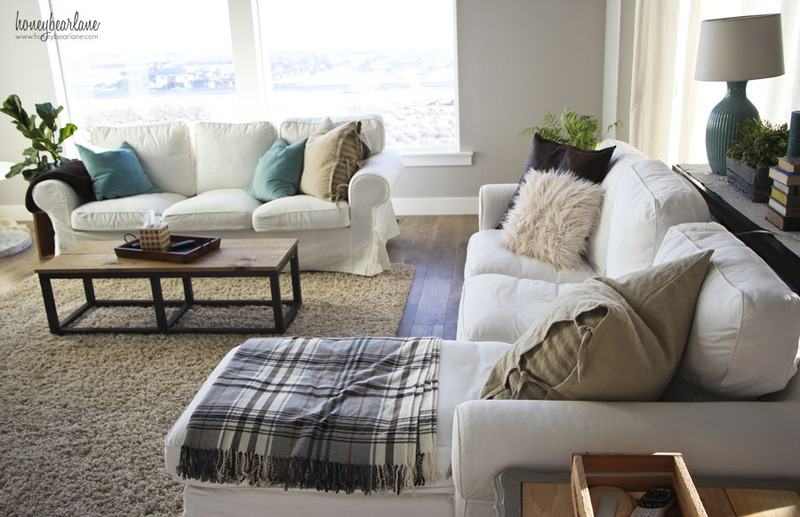 I have white couch slipcovers–three of them (two IKEA Ektorp couches, one I made myself), white kitchen cabinets, white countertop, white bathroom everything, just white, white, white. I convinced my husband that we would not be living in a sterile hospital because I was going to bring in a lot of accent colors. He trusts my design sense, which is quite a relief. But living with white is not completely normal–it takes a certain sense of upkeep and craftiness, for lack of a better word. You have to take care of it a little more. But don’t worry, you don’t have to take care of it a LOT more. 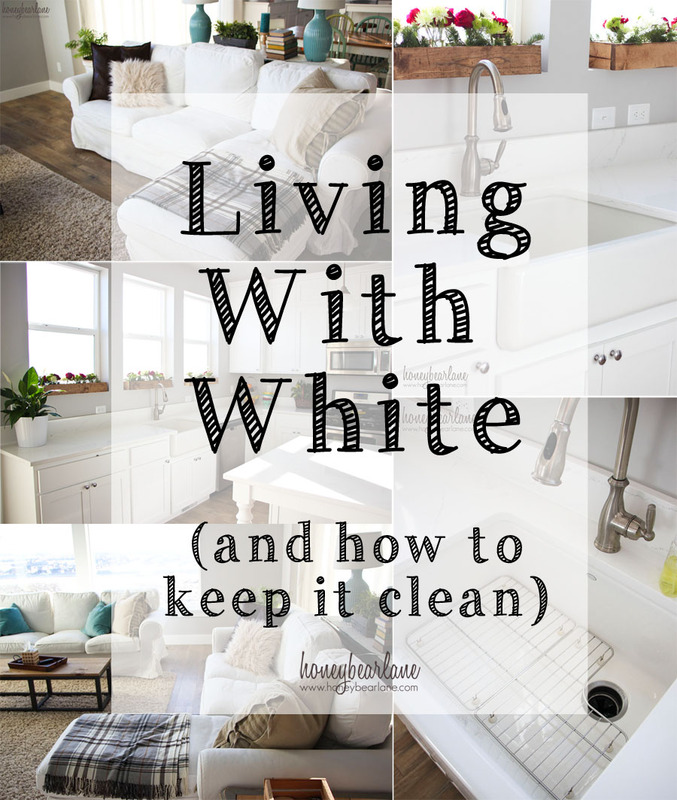 Here are my best tricks for keeping all my white stuff clean-ish. I’m not going to lie and say it’s always spotless, but nothing in my life is. However, I might be a little higher maintenance, but that is a small sacrifice for having a house I love to look at. I would rather have white couches than microfiber, which is supposedly easier to take care of my but microfiber stuff always looks terrible. Living with white is kind of like a lifestyle choice. You decide that’s what you want, and then you choose to take care of it–like a pet. But remember that everything gets dirty at some point so you really should be taking care to upkeep your house anyway! 1. Have bleach and Oxi-Clean spray. My best way for keeping my couches clean is to wash the slipcovers about once every two months (sometimes I will wash parts of it more than that). I soak them in cold water (in the washer) with bleach and laundry detergent. I treat spots with Oxi-Clean spray which gets everything out, even grease. Then I wash them and dry them partially in the dryer. I put them back on the couch while they are still slightly wet and this way they are much easier to put on and dry without wrinkles. 2. Protect the white couches with quilts and throws. I have this chaise on one of my couches and it seems to get dirty really easily. So I always have a throw blanket or quilt draped over it, which adds to the design but also protects that part from getting dirty as quickly. Also I try to keep my throw pillows protecting the arms of the couch–these are spots that aren’t as quick to clean and seem to attract dirt the fastest. My upstairs couch, my old couch with slipcover I made myself, always has a quilt on it. I hate washing that slipcover because I made it so well fit that it’s a full body workout to take them off and put them on. Plus it’s in the kids area now so I’m planning on replacing that couch with a gray one. I probably wouldn’t put a white couch in a kids area unless it was leather. 3. 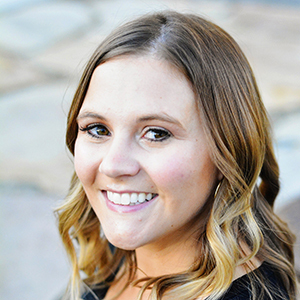 Stricter rules: I don’t want to be ‘that’ mom, but I don’t let my kids eat anywhere but in the kitchen and dining room, unless it’s something that won’t really make a mess. I also don’t let them take crayons or markers anywhere but in the kitchen/dining area but that is because of too many mishaps (and naughty children) with markings on the wall and furniture. I also make sure they wash their hands and face after they eat. But really, these are just good habits to be a properly functioning person. And I do let adults eat while sitting on the couches. The couches get little marks on them, sure…and I don’t throw the slipcovers in the wash the second it happens. But that is life with kids. Any couch is going to get dirty and I love the fact that when mine does, I can just throw the covers in the wash and they come out squeaky clean, like I have a brand new couch. White rugs: Let me interject really quickly that I had a white rug once and I won’t do that again. I loved the look of it, especially in pictures, but it was a nightmare keeping it clean. I actually stuffed it (a 5×7!) into my washing machine a few times to wash it but that is so hard on the washer. And when my son puked on it once it was impossible to scrub the stain out. If you choose to get white, make sure you can wash it fairly easily. Large white rugs do NOT wash easily. 4. White countertops: I have white quartz countertops. I really love them and quartz is pretty low maintenance, but it has still proven to stain a bit. My son spilled Diet Coke on the countertop and it stained immediately! I think it’s because Diet Coke is so acidic or something. We tried a Magic Eraser on it and it didn’t really work, but the Oxi-Clean spray worked great. It took the stain right off. I wipe them clean every day with those wet wipes from Costco. I used to clean them with a sponge but the water from the sponge just sat on the surface and didn’t dry…I can’t really explain. It just seemed more wet and not as clean. This also goes for my bathroom countertops. So I use the wet wipes and then if I don’t want streaks I will dry it with a micro-fiber cloth. 5. 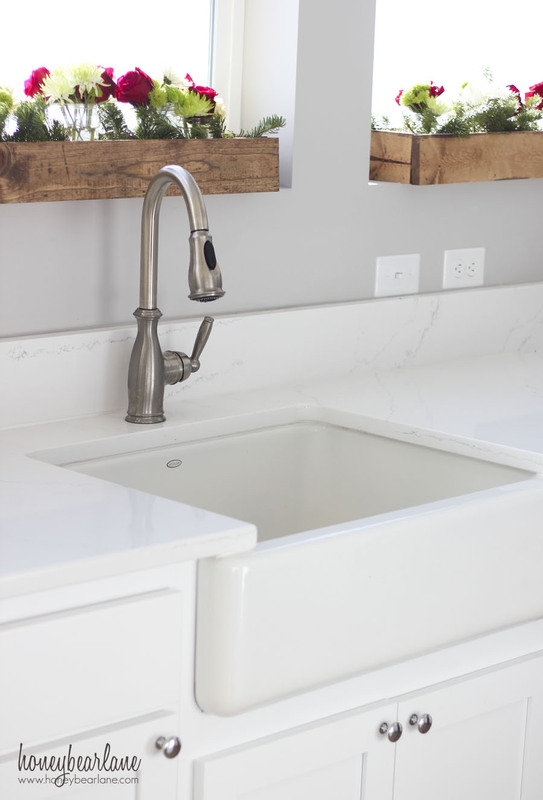 White farmhouse sink: I love my sink but I greatly debated the cast iron vs the stainless steel when we were building the house. I asked both people on Instagram and on Hometalk and the cast iron sink won hands down with tons of responses. Everyone likes the style more and many people said their cast iron sink stayed looking way cleaner than the stainless steel. 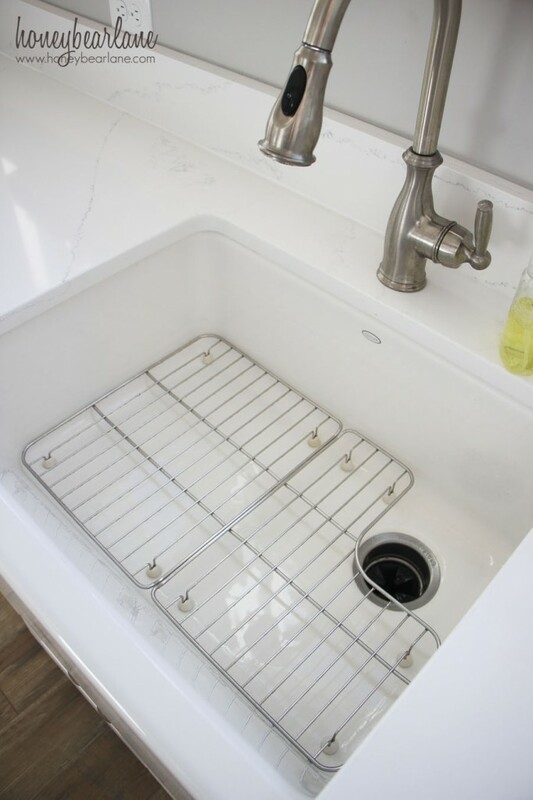 I actually have two kitchen sinks–one cast iron farmhouse sink and one small stainless steel prep sink. My little prep sink gets used far less and looks dirty all the time. It always has little water spots on it. But so far my white sink looks gorgeous all the time, except when everyone’s put their dirty dishes in there. But after I do the dishes, I rinse out the sink and it looks good as new. I haven’t cleaned it yet, but when I do I will use Bar Keeper’s Friend, which is great for white porcelain. It is somewhat abrasive so use it sparingly and don’t clean your sink every day with it. 6. Bathroom surfaces like bathtub and shower: We opted to get white on white cultured marble for the bathtub and shower. It’s a nice clean look and was way cheaper than tile. Someday we will add tile to the bath but the shower we like as it is. We just clean it after we shower with a squeegee and when we do our deeper cleaning we will also use Bar Keeper’s friend and Kaboom shower cleaner. 7. White or light tile: This got dirty so quickly! Our best solution was to buy some good bathroom rugs. Once we had the rugs, it seems a lot cleaner. And now we just spot mop with those wet wipes from Costco. When we do a deep clean, I will mop it with my steam mop. But if we seal the grout, it will help it stay cleaner. I’m not one of those people who has a spotless house. I wish I did, and I’m working on it. Believe it or not, moving to my new house has really helped with the cleanliness–everything has a place! Or it will soon. You’d think that someone like me would be happier with non-white stuff…easier to clean maybe? But I’ve made the choice to have the stuff I like and to dedicate some time to taking care of it. I adore my house. ADORE. I feel so lucky to live in it. It’s been a long time coming and I’ve yearned for my own house for almost nine years. So I will definitely take care of it! PS–I just want to say that my floors (laminate!) are amazing. They hide SO.MUCH.DIRT. I still have to sweep a lot and Swiffer once a day (kids, right?) but if I had a spot it is super hard to see and I hardly ever see footprints. Best decision ever. Beautiful home, Heidi! I love white, too. Two questions: where did you get those gorgeous bar stools? And what is your wall color? Love both! And I never would’ve guessed your floors were laminate. They look like hardwood. Love the color. I got the bar stools from World Market and my wall color is called Gray Spell but I forgot the brand. I color matched it to SW Passive Gray–my fave gray. Thanks! The countertops are called Tranquility…I can’t remember the brand…maybe Hanstone? Beautiful home and it looks very easy to clean. I had ours built 5 years ago, I had laminate wood laid in the upstairs bedroom/living room area. I had wood ran in the rest of the house except bathrooms and laundry room. My laminate has been the best and easy to take care of. Real wood has some black stains here and there where it was left with a wet spot that I didn’t catch as you really can’t see to much on the floor. Wish I used laminate through out my house. Stainless steel sink in my kitchen, should have used cast iron. I love your choice in sink that would be what I would want to have. You have a lovely home. Congratulations! Thanks Debbie! I love the laminate! Love your home. We are in the beginning phases of building a house and I am wondering if you can tell me the dimensions of your kitchen and island, I love the look! 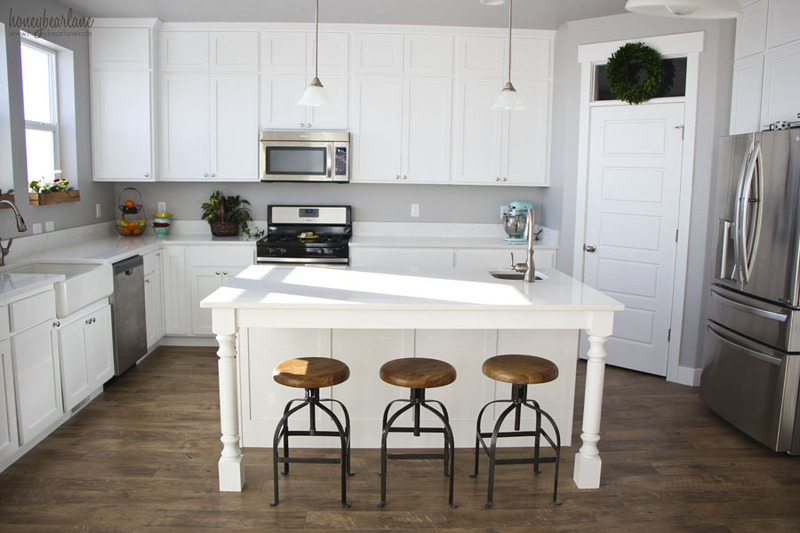 Never thought I would want the white on white (I always thought white with darker counters) but I love it! Thanks! Thanks! The kitchen is 18′ x 14′ with 9 foot ceilings and the island is 4×6′. I think the island is the perfect size, don’t know if I’d ever want bigger. I wrestled between darker counters and sometimes I think it would be nice still but I love the nice clean look and the dark shows more crumbs and streaks, especially in the sunlight which we have a lot of! I highly recommend a roomba for the floors. Life changing! Really! I have thought about it and pretty much wish I had one every day. Guess it’s going on my wish list! Thanks! Can you tell me the brand and name of your laminate? Its awesome and would love to use it in my own home! Thanks! It’s Mannington Historic Oak in Ash. Thanks! Love the turquoise table lamps! Could you tell me where you purchased them? House looks fantastic! Thank you! They are from Walmart actually! Where did you get the tie shams? I love them!